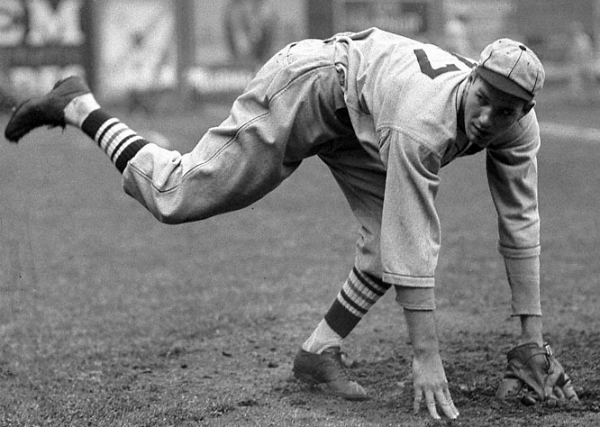 It’s rare that the last time a pitcher accomplished a feat was in the 1930s, but one of Dizzy Dean’s records still stands today. Dean was the last National League pitcher to win 30 games in a season, which he did in 1934 as part of the World Series winning Gashouse Gang 1934 Cardinals. And Dean’s No. 17 — as we have only 17 days until Opening Night at Wrigley Field — was retired by the Cards for the Hall of Famer in 1974. Diz finished with 30 wins, the only NL pitcher to do so in the post-1920 live-ball era, and Paul finished with 19, for a total of 49. The Cards needed them all to edge the Giants for the pennant, setting up a matchup with the American League champion Detroit Tigers. There’s a great post on Dizzy’s 30th win that’s well worth checking out by Mark Tomasik at RetroSimba. By 1938, Dean’s arm was largely gone. Chicago Cubs scout Clarence “Pants” Rowland was tasked with the unenviable job of obeying owner P. K. Wrigley’s direct order to buy a washed-up Dizzy Dean’s contract at any cost. Rowland signed the ragged righty for $185,000, one of the most expensive loss-leader contracts in baseball history. But he did help the Cubs win the NL pennant in 1938, and pitched for them through 1940. Dean was inducted into the St. Louis Sports Hall of Fame in 2010. Here’s the highlight video from that enshrinement. And now just 17 days! This entry was posted in 2015 Cardinals and tagged 1934 World Series, Countdown to Opening Day, Dizzy Dean, Gas House Gang by Christine Coleman. Bookmark the permalink.